Scaffold Store: The Best Scaffolding at the Best Scaffolding Prices Possible. ScaffoldStore.com is a division of Scaffolding Today, Inc., one of the largest and oldest manufacturers of quality scaffolding and shoring in the United States. As a manufacturer, we have complete control over product quality! All products are tested at an independent, ISO certified testing facility and are certified to meet and or exceed OSHA and ANSI testing standards and covered by our product liability insurance! With warehouses in Houston, TX; North Bergen, NJ; and, Philadelphia, PA, we are capable of delivering your order to your door step or job site. Are you in the mid-west, or on the west coast? 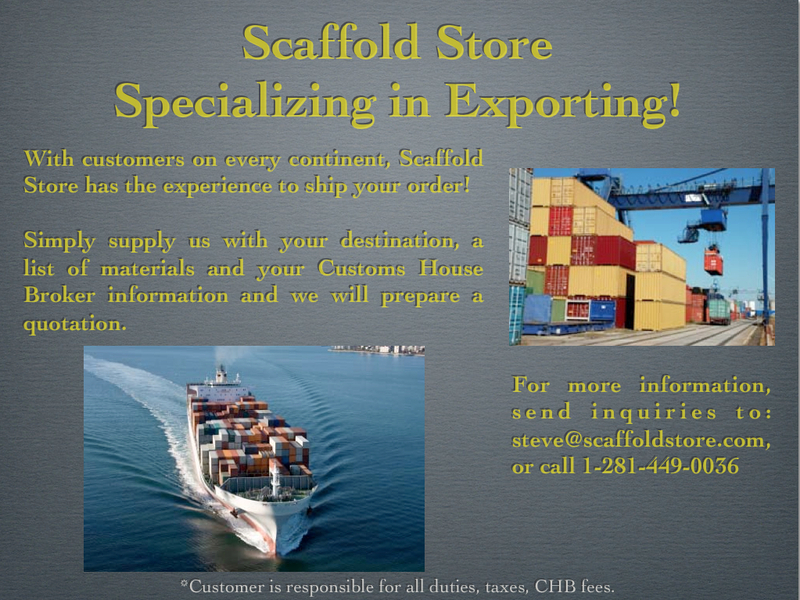 No worries, ScaffoldStore.com ships orders all over the United States on a daily basis. Because of the amount of orders we ship, we receive the most competitive shipping rates from all of our shipping vendors (UPS, Old Dominion Freight Lines, SAIA; FedEx Freight; etc.). ScaffoldStore.com is the favorite and trusted scaffold supplier of the largest contractors, including New York City School Construction Authority Contractors and members of the Scaffold Industry Association! All ScaffoldStore.com employees are OSHA certified to design and calculate allowable loads on scaffolding; as well as OSHA Competent Person trained to erect and dismantle scaffolding. With more that 100 years combined experience, we are confident we can solve your problem with keeping your safety in the forefront! Our years as a successful business is a bi-product of happy customers. We believe if you treat your customers with respect, offer the best possible customer service, only sell the highest quality products, and maintain competitive pricing, the customers will keep returning... And they have! Give us a call today and join the thousands of satisfied ScaffoldStore.com customers! ScaffoldStore.com is dedicated to delivering the highest quality scaffolding and shoring! We are so confidant in our product, we will offer a free replacement if there are any defects in product manufacturing. Our goal is to exceed customer expectations. 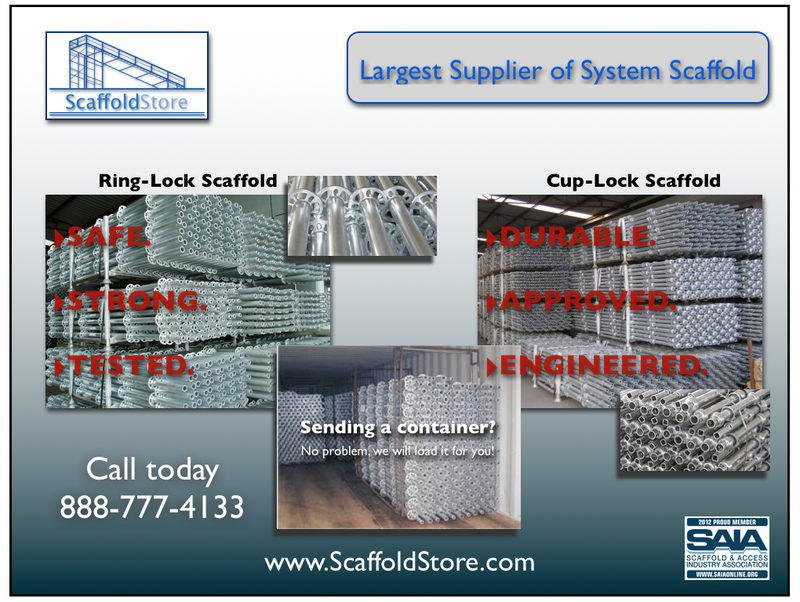 ScaffoldStore.com sells only the strongest, most durable scaffolding in the industry. We are so confident in our products, we are the ONLY scaffold company that has put our money where our quality is by offering a 5-Year consumer warranty!